Marten Seppel and I have recently published an edited volume Cameralism in Practice. State Administration and Economy in Early Modern Europe (Boydell and Brewer, Woodbridge 2017) and this is the text of a discussion we recently had about it. Marten Seppel: It seems that the idea of putting together a volume on the practical side of cameralism has come at just the right time. There has been a growing interest in cameralism over the last five to ten years. A number of substantial studies exploring the essence, impact and spread of cameralist teaching in early modern Europe have appeared. In addition there are some ongoing projects and developing networks related to cameralism. In 1987 Jürgen Backhaus wrote that the only scholarly book-length treatment of cameralism in English was a 1909 work by Albion Small.1 I believe there has been some progress over the last thirty years. Do you think that cameralism has been attracting growing interest in the anglophone literature, and how do you explain this? Keith Tribe: Small’s book remains very readable, although it is true that it fell into obscurity. And the reasons for that are significant. Firstly, because of a continuing lack of development in serious historical understanding of the social sciences – Small founded the Department of Sociology at Chicago which he then headed for years, and he also was a founder of the American Journal of Sociology. And he wrote a book on Adam Smith too. So out of all that one might ask how these things that might seem unrelated to us today were not then unrelated. And secondly, because the implication of the first point is that we should always keep in view historiography: how these things fitted together for Small, but why cameralism, and Small himself, fell into obscurity. That has a great deal to do with the way that the history of economic thought developed as a sub-discipline in the latter part of the twentieth century as primarily an anglophone history – it became primarily a story written by anglophone economists about other anglophone economists, and so if it meant anything at all “cameralism” meant “German mercantilism”. Fortunately, things are changing: the annual conferences of the European Society for the History of Economic Thought are dominated by young French and Italian scholars; the developing field of intellectual history has upgraded the quality of work done in the history of economics; and from the later 1970s onwards the history of eighteenth century political thought has emerged as a very sophisticated field, within which the study of cameralism no longer seems such a minority interest. It is from this last area in particular that I have drawn for my own work, and where I also find the readiest reception. Marten Seppel: When it comes to the essence of cameralism, you have stressed that cameralism was first of all a language and an academic discipline. It is clear that cameralism was a pedagogy, a discourse(s), a genre of literature and a way of thinking. However, our collection still does not offer any more concrete definition of cameralism. Do you think that cameralism is at all definable? We still somehow recognize the specific logic of cameralism. Or is it easier to say what cameralism was not (e.g. compared to mercantilism, though I know that you have tried to avoid the concept of mercantilism at all in this context). Keith Tribe: When I studied the literature of the Cameral- und Staatswissenschaften in the 1980s I was reading works that defined themselves as part of this genre, generated by the practical demands of university teaching. In some cases, as with the German reception of Physiocracy, you could also see that this body of writing was more or less entirely peripheral, and so that distance itself became something that one could explore and think about. I do not think it very helpful to allow subsequent classifications to dictate how one approaches and filters past writing – this is the most general criticism one can make of the idea that there ever was such a thing as “mercantilism”. Of course, in the English language we use the label “cameralism” in part because of the idiosyncratic way that “science” has become defined, so it is an “ism”, not a “science”. As a shorthand way of designating material for study “cameralism” is fine, but it is not something that can bear a lot of analytical weight. If there is a “logic” to “cameralism”, however, then it could be described as a literature of economic management. Thought about this way, it then becomes more obvious quite why it is so hard to define, since there is no strictly equivalent body of writing in contemporary languages such as English and French – Italian is different, but here again, the older conventional anglophone bias of HET meant that some French material would be included, but hardly anyone outside Italy read Italian in the later twentieth century, and the Italians themselves have only relatively recently shown an interest in making Italian economic material accessible to non-Italians. Marten Seppel: Cameralism has been given various chronologies. A very broad approach starts looking for a cameralist tradition already in the 16th century (e.g. Albion Small, Magdalena Humpert, more recently Jürgen Bachhaus and Richard Wagner). More popular is the view that cameralism was only an eighteenth-century discipline. Or does the truth lay somewhere between these two extremes? How do you see the genealogy of cameralism, and the time frame of this tradition? Keith Tribe: This follows on from the previous point: that we should begin with the way in which writing defines itself, and not seek to create a special category of “cameralism” that we then use to sieve through economic literature. Etymologically “Cameralwissenschaft” is a discourse founded upon the emergent tasks of later seventeenth century domain administration that developed into a discourse about state administration in general. Although a Wissenschaft is not exclusively a body of learning linked to a university, that was what Cameralwissenschaft meant by the early eighteenth century, when the first proposals for systematic training in domain administration were made. That the practice of state administration deviated to a greater or lesser degree from arguments about the rational organisation of state administration should not blind us to the importance of studying arguments that sought to systematise economic activity. Marten Seppel: The present collection focuses on the practices of cameralism. In the 1930s August Wolfgang Gerloff argued that eighteenth-century cameral science was “die Lehre von der Staatspraxis, die Lehre von der praktischen Politik” (a doctrine directed to state practice, to practical politics).2 However, Andre Wakefield writes that cameralism was a kind of fantasy fiction or even a utopian theory, rather than any particular plan that could be followed by administration. He believes that cameralist authors did realise that their teaching was too theoretical. What is your impression of this issue, and do you think that our collection has contributed to this debate – whether cameralist teaching was merely theoretical, and detached from cameralist practice. Keith Tribe: I think the idea that theory and practice are distinct and contrasted is unhelpful; but I also dislike the invocation of “practice” that one encounters today, as if by talking of everything as a “practice” we can avoid the hard work of describing exactly what people do, why they do it, how they understand what they do and why they do it, how they came to be able to do what they do, and hence also the institutional frameworks that make all of this possible as a social activity. Cameralism is an interesting way into all these things because it is a discourse about administration, about organising activity, which both in its exposition and execution is exposed to greater or lesser slippage. In our book we have contributions that look at forestry, mining, manufacture, insurance, labour organisation and iron-making – areas of practical activity that are themselves the object of arguments over state management. When Gerloff talks of a Lehre he is referring to “a systematic collection of ideas and principles” that is first of all interrogated in terms of quite how systematic it is. What we have done in collecting together these essays on various practical fields of activity is to shift the attention from the examination of this “system” to its relationship with those areas of activity to which it is addressed. But those “real people” conducting this activity are themselves part of this “system” insofar as they are not blank pages, nor automatons simply following orders. Here again, we could say that the value of studying cameralist literature is to open up these issues – about how “an economy” “actually works”. Marten Seppel: It has become more and more clear (as argued also our collection) that besides Germany and Austria, cameralist literature on state and economy also had great influence in Sweden, Russia, Denmark and even Portugal. At the same time, you have written that “cameralistic writers were largely indifferent to contemporary developments in French, English, and Italian economic literature -a lack of interest that was entirely reciprocated”. This quote can easily cause misunderstandings. What did you mean by this conclusion in the Encyclopedia of the Enlightenment (ed. by Alan Charles Kors)? Keith Tribe: I would stand by what I wrote in the mid 1990s about France and Britain, but I then knew less about Italian literature than I do now. All the same, the first part of the statement is true enough – my study of the German language literature had demonstrated to me the general lack of engagement with non-German language literature, and my study of translations into and out of the German language reinforced this. Subsequently I was criticised for this, although as I pointed out in my Cambridge History of Eighteenth Century Political Thought entry, the geographical space within which cameralism was “confined” was extremely large, including the Baltic, Eastern Europe and Russia. This is very much reflected in the work of our contributors. Furthermore, already in my Governing Economy (1988) I cautioned about using library catalogues as a prime source of evidence about translations and diffusion. Certainly German libraries did not systematically acquire translations into the language; while the existence of a translation is only preliminary evidence of diffusion. Fania Oz-Salzberger’s book on Adam Ferguson and the German Enlightenment, Translating the Enlightenment (1995), remains the classic study here. Then as now, books were more often cited than read, and to track down the pathways through which ideas and arguments diffuse you need to be able to demonstrate more than that a book was published in one place, or can be found in a library somewhere else. Alexandre Mendes-Cunha and Roger Bartlett do an excellent job in the book of showing exactly how “ideas travel” – whether to Brazil or to Russia. Marten Seppel: One of the main goals of our book was to bring out the innovative tendencies associated with cameralist discourse in the eighteenth century.So a short and concrete question to you – did cameralism change the world? Or could we pose such a question at all? In fact, at the beginning of the editing of this collection I was willing to talk about a “cameralist turn” or even a “cameralist revolution”, but you persuaded me to abandon these kind of titles as being little more than empty phrases and entirely unhelpful. Keith Tribe: I think that we need to be cautious about hanging our ideas on a slick phrase or image to which a historical narrative must then be bent. There are many “revolutions” that, at best, end up where they started out – look at the “French Revolution”, it only took the French just over eleven years from executing a king to acquiring a new Emperor! And if that was not bad enough, it all happened again from 1848 to 1851! More seriously, as with my comments about needing to be aware of the historiography, it is too easy to assimilate ideas of “progress” to a present-centred history lacking an understanding of past historical commentary and argument. While it would be wrong to suggest that cameralism in some way changed the world, what we can say is that it changed the language with which the world was conceived. Whatever the outcome of cameralist “practice”, by the later part of the eighteenth century there was a new language of state administration that became transformed into the financial sciences of the nineteenth century, and thence became part of the language of public administration. It gave “practitioners” a way of talking to each other about the way in which they conducted their affairs. Another important point to which Paul Warde drew our attention was the way that in one way or another most reforms fail. To measure cameralism by “success” or “failure” implies a sense of progress that Herbert Butterfield characterised as “Whig history”, and while the details of his argument are now mostly forgotten, it is generally accepted that this kind of retrospective history is solipsistic. The idea that cameralism promoted practical or innovative measures should be separated from any sense of “progress”, and our evaluation of cameralist ideas and principles should not be dominated by any question of their degree of “success”. Marten Seppel: So what is the future of cameralism studies? How might this work develop in an interesting way? Do you believe that cameralism will become as familiar in textbooks as mercantilism? Has the concept of cameralism established itself as a central historical concept in Central European history and beyond? For example, in 1958 Hans Rosenberg wrote his well-known monograph on the development of bureaucracy in the long Prussian eighteenth century without ever mentioning once the word ‘cameralism’, or authors like Justi. Do you think this remains a valid approach to the period? Though one must admit that the twin-brother of cameralism, the police sciences, are already accepted in historical writing. Keith Tribe: What the study of cameralist literature has brought to light is the extent of our ignorance about early modern Europe, its politics and administration, its economy and society. The sheer volume of material that recent work has revealed compels us to think about new ways of exploring networks of activity and argument. Rosenberg’s work on Prussia remains important, but today it would not be appropriate to write a history of bureaucratic rule without examining the language of administration. The key to that lies in the study of cameralist literature and its language, and in a new approach to the work of administration in the European states of the eighteenth century. As I suggest above, my problem with “mercantilism” is that it presents a grid that obscures from us both diversity and convergence in early modern economic literature. Insofar as our book on cameralism and administration shows the sheer diversity of this material, I hope that it provides encouragement to others to explore this literature more systematically than has ever before been attempted. 1Juergen Backhaus, Richard E. Wagner, “The Cameralists: A Public Choice Perspective”, Public Choice 53 (1987), p. 3 (3-20). 2August Wolfgang Gerloff, Staatstheorie und Staatspraxis des kameralistischen Verwaltungsstaates (Breslau, 1937), p. 35. This entry was posted in Economic Administration, History of Economics, Language, Uncategorized on October 25, 2017 by Keith Tribe. In recent days much has been written and said about the election of Jeremy Corbyn, a Labour MP with no known experience of running anything at all beyond his own life, as leader of Britain’s Labour Party. He was elected through a process that was intended to be “more democratic” than the last democratic election process, but which seems to have produced a result at odds with the wishes of most active members of the Labour Party and almost all its MPs. The new process permitted all kinds of people who had not even voted Labour in the recent general election to “have their say”. Matters were not helped by the fact that Corbyn had so little support among Labour MPs that he only gained sufficient nominations to put himself forward as a candidate through nominations from MPs who wished the field to be “representative”. This alone shows the poverty of imagination of those rightly dubbed “morons”, since the point of having a threshold is to exclude candidates who lack broad support. It is not yet clear how things will turn out. The only certain thing is that current punditry is well off the mark: the Labour Party of today is the same Labour Party of last week, except that it has a new leader. Quite what this new leader will, or can, do with his unexpected elevation is unclear. Anthony King, in Who Governs Britain?, has plausibly argued that the British Prime Minister has very limited power, and much the same is true of the Leader of the Opposition. Quite what counts as “strong” or “weak” leadership should always be treated with scepticism. Media preoccupation with “strong” leadership in politics, business and academia is generally linked to poor understanding of what leadership involves, and a focus on “words” over “actions”. Max Weber wrote the book on all this during 1918-1919, and what he wrote then still stands as the most insightful assessment of politics in a modern parliamentary democracy. So this post is not about the end of the Labour Party as we know it, nor about the triumph of the popular will, nor about the rhetoric about the “hard left”, “centre” and “the right”. I want to focus attention on the sheer poverty in public discussion of “democracy” and “leadership”. For Corbyn’s election is not an isolated event in this context; this year we have seen the confrontation of EU officials and member states with Greece, a Scottish referendum, a Greek referendum, and the election of a new British Government. Discussion of all of these has involved much muddled-thinking about “democracy” – principally, the illusion that there is such a simple and self-evident thing as “Democracy” that produces “popular results”. “Democracy” is rule by the people; but who are “the people”? For the Greeks who invented the idea, during a period around 400 BC political and judicial decisions were made by a collection of adult males who happened to attend on one day. All debate and votes took place on the same day; women were excluded; slaves were excluded; all aliens were excluded; all children and young adults were excluded; all those free adult males who did not attend were excluded. How those present made up their minds to vote this way or that was not really a matter of rational debate; this was always subject to the fluency of orators and their scriptwriters. But it worked for a while; and some kind of “democratic process” has always worked better than the alternatives, because it creates a basic legitimacy and, very importantly, creates a system for changing the people who make the rules and make the decisions without resort to murder and civil war. The importance of all this was presented in extenso four hundred years ago in Shakespeare’s History plays. It remains an issue in the world today. The downside is always that the process of democracy is messy, argumentative and a massive waste of everyone’s time; but those who deplore the windbaggery of the European Parliament and yearn for “strong leadership” should be careful what they wish for. Democracy is not so much about “the popular will” (since the Greeks already demonstrated how indistinct that was) as about institutions and process. As a student I was taught by Jean Blondel, whose Voters, Parties and Leaders (1963) had drawn attention to the way that democratic decision-making was generally dominated by a minority; that what looked like a “majority vote” was usually the outcome of a shift, for whatever reason, in the opinions of a very small number of people. This gave birth to the idea of the “swing voter”, again, another poorly understood phenomenon since here statistical probability and random phenomena intersect. When the opinion polls judged the Scottish Referendum “too close to call”, commentators forgot that this only ever means a range, and that 45/55 as it did turn out was in the circumstances predictable, especially since Glasgow and Dundee, in the only pro-independence results, had the lowest turnouts. As with the Greeks above: if you do not turn up, you have no vote. Another example is that of the current British government, which commands a majority of seats in parliament having won 36.9% of the votes actually cast, “trouncing” a Labour Party which won 30.4%. Since one-third of those registered to vote did not do so, this would give the present Government the express support of about a quarter of all qualified voters. In part this is the product of the electoral system, but there is no prospect of change to this since any reform would have to be implemented by a government whose majority was owed to the mechanics of the first-past-the-post system. And there are many variants of proportional representation, and no perfect statistical system for matching voters to constituencies and parties, as US Congressional elections demonstrate. Another aspect of the first-past-the-post system is the way that it randomly punishes and rewards small parties. In the current UK Parliament, the SNP won 4.7% of the vote, and has 56 seats; the Liberal Democrats gained 7.9% of the vote, and have 8 seats. UKIP, whose core vote seems always until recently to have been around 15% of the electorate, has yet to secure one seat through its own efforts (their one MP defected with his constituency from the Tory party). it is arguable that thresholds for small parties, as with the German 5% of the total vote, are “more democratic”; but the basic arithmetic generated by the British electoral system is unlikely to change. Which brings me back to a point no-one seems to have noticed about the Corbyn election. If he does prove unsuitable as a leader, in whatever way, how could he be replaced by someone more centrist, given that he is the (unanticipated) product of the new rules? He is a product of the rules, not of the Party. Arguably, the Labour Party should elect its leaders in a process that involves the Party as a whole ranking candidates in an election, from which the Parliamentary Party then chooses the leader most likely to lead the Party with competence from among, say, the top five. They will have a better idea of who would make a good leader than the electorate at large; but this thought is probably “undemocratic”. What might this mean? This entry was posted in Democracy, Electoral politics, Language and tagged Corbyn, Democracy, Labour Party on September 14, 2015 by Keith Tribe. In my new book I argue that the proper object of the “history of economic thought” is the analysis of economic language; and that, therefore, this should be conceived primarily as a philological practice. While the “economy of the word” can be read as an enterprise addressed to verbal rather than mathematical representations of economic argument, it is also another way of describing the object of philological studies: the organisation and arrangement of language. Placed together, these two ideas shape the book: that “economy” has a range of historical and contemporary meanings, and that exploration of these meanings requires that we pay attention to the organisation of language, and the production of meaning through such organisation. This orientation to economics and to language is sketched out in the first and last chapters. The remainder of the book seeks to demonstrate the results gained by adopting such a stance: examining the shifts in meaning of “economy” over two and a half millennia; the work involved in transforming the concept of “national dividend” into a number now known as GDP; Adam Smith’s treatment of international trade in his Wealth of Nations; the transformation of Smith’s writings into the object of modern scholarship via the “Adam Smith Problem”; the manner in which Karl Marx first encountered political economy and how this encounter shaped Capital Vol. I; and exactly where “Walrasian Economics” comes from. Throughout, there is is an interest in the way in which texts are constructed – physically, as books; conceptually, as arguments placed in relation to prior sources, seeking the manner in which these sources are preserved, displaced, transformed, rearranged, possibly merely repeated. By treating this as a complex process of linguistic recovery and repetition it is possible to show quite how we might read texts “in context”, hence the emphasis upon philological scholarship. This captures the basis of philological work, language as text, displaced in the early twentieth century by a new linguistics that re-directed attention to the structure of contemporary speech rather than the historical sources of contemporary language use; a modern linguistics whose elementary building blocks were commandeered by cultural critics who then used them to read the world as “text”. It is time to go back to the historical sources of language. Mind was the first academic journal to begin regular publication in Britain. Philosophy is today a very restricted version of what that journal then represented. The title would translate into German as Geist. And in its early volumes we encounter psychology, the study of language, moral philosophy, education and epistemology all on an equal footing. In turn these formed part of the moral sciences; and, as such, part of the history of economics. 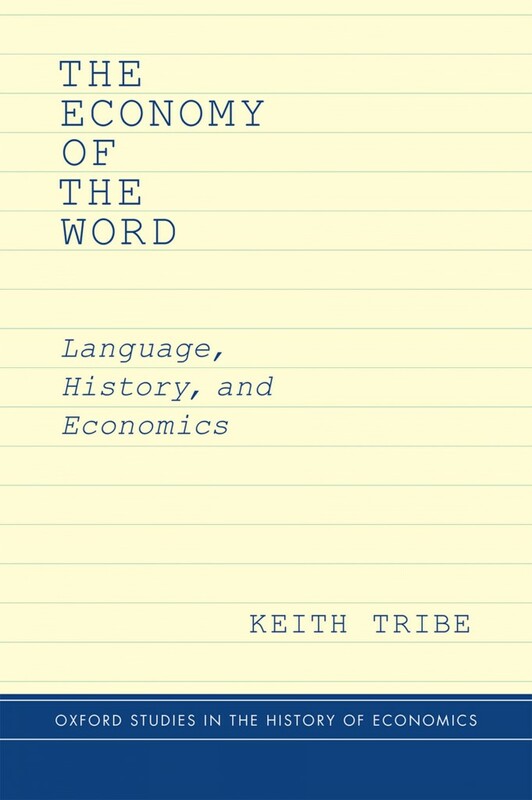 This entry was posted in History of Economics, Language, Philology and tagged Economy of the Word, Oxford Studies in the History of Economics on December 29, 2014 by Keith Tribe.